The Global Volcanism Program has no activity reports for Andrus. The Global Volcanism Program has no Weekly Reports available for Andrus. The Global Volcanism Program has no Bulletin Reports available for Andrus. Three coalescing trachytic shield volcanoes with a combined volume of 252 km3 formed during the Miocene along a N-S line in the Ames Range of western Marie Byrd Land. The youngest and best exposed is Mount Andrus, the southernmost volcano, where late-stage volcanic activity resumed during the late-Pleistocene or Holocene (Gonzalez-Ferran and Gonzalez-Bonorino 1972, LeMasurier and Thomson 1990). A distinct 4.5-km-wide caldera truncates the summit of Mount Andrus. Weak fumarolic activity was observed in 1977 at Mount Kauffman, the northernmost volcano, which also has a morphologically distinct 3-km-wide summit caldera. Gonzalez-Ferran O, Gonzalez-Bonorino F, 1972. The volcanic ranges of Marie Byrd land between long 100° and 140° W. In: Adie R J (ed) Antarctic Geol and Geophys, IUGS Ser-B(1): 261-275. The Global Volcanism Program is not aware of any Holocene eruptions from Andrus. If this volcano has had large eruptions (VEI >= 4) prior to 10,000 years ago, information might be found on the Andrus page in the LaMEVE (Large Magnitude Explosive Volcanic Eruptions) database, a part of the Volcano Global Risk Identification and Analysis Project (VOGRIPA). There is no Deformation History data available for Andrus. There is no Emissions History data available for Andrus. 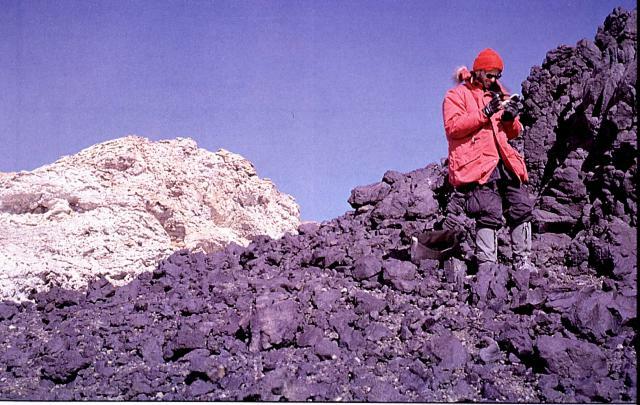 A geologist examines trachytic lava flows west of the caldera of Mount Andrus. This volcano is the youngest and best exposed of three N-S-trending volcanoes in the Ames Range of western Marie Byrd Land. A distinct 4.5-km-wide caldera truncates the summit of Mount Andrus. Weak fumarolic activity was observed in 1977 at Mount Kauffman, the northernmost volcano of the Ames Range. The Global Volcanism Program has no maps available for Andrus. There are no samples for Andrus in the Smithsonian's NMNH Department of Mineral Sciences Rock and Ore collection. Large Eruptions of Andrus Information about large Quaternary eruptions (VEI >= 4) is cataloged in the Large Magnitude Explosive Volcanic Eruptions (LaMEVE) database of the Volcano Global Risk Identification and Analysis Project (VOGRIPA).